Anthony Foxx: "Keeping drivers safe is the most important advantage of V2V, but it's just one of many." WASHINGTON -- After years of research into vehicle-to-vehicle communications technology, federal regulators declared that the time has come for cars to talk to each other to improve safety. 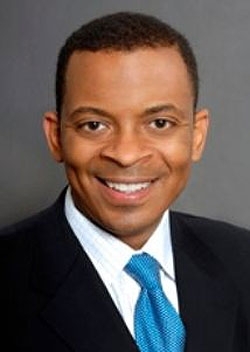 U.S. regulators will soon begin working on regulations requiring new light-duty vehicles sold in the United States to be equipped with wireless chips so they can communicate over the airwaves, U.S. Transportation Secretary Anthony Foxx said today during a press conference at Department of Transportation headquarters. Foxx stopped short of setting a target date for the mandate, but he made clear that he is committed to the technology, calling it a "moon shot" that could prevent 70 to 80 percent of crashes involving unimpaired drivers. "Keeping drivers safe is the most important advantage of V2V, but it's just one of many," Foxx said. "V2V can also help reduce congestion and save fuel. The potential of this technology is absolutely enormous." David Friedman, acting administrator of the National Highway Traffic Safety Administration, said it would be an innovation in highway driving matched only by the creation of the interstate highway system. "This is that important of a moment in time," he said. Government engineers and a consortium of leading automakers, including General Motors, Toyota and Volkswagen, have worked for more than a decade to write the rules for what some people have taken to calling "the Internet of cars." These "connected cars" would communicate over a special wireless frequency called Dedicated Short-Range Communications, or DSRC. That sets the technology apart from the 3G and 4G cellular networks that automakers are already putting into cars to offer Internet-based services. The Alliance of Automobile Manufacturers, automakers' main lobbying group in Washington, said that it recognizes the benefits of DSRC technology, but that there are issues that need to be resolved. Gloria Bergquist, a spokeswoman for the Alliance, said the group's members would prefer a voluntary agreement to a mandate. "DSRC radios may play a larger role in future road safety, but many pieces of a large puzzle still need to fit together," Bergquist said in a statement. "We need to address security and privacy, along with consumer acceptance, affordability, achieving the critical mass to enable the 'network effect' and establishment of the necessary legal and regulatory framework." Car companies have voluntarily pledged to roll out connected cars in Europe, with the first cars hitting the road in 2015. In a report last year, the London-based consultancy ABI Research predicted that global penetration of the technology in new vehicles will grow from 10 percent in 2018 to 70 percent in 2027. The new DSRC system functions much like the Wi-fi used by personal computers, and performs some of the functions of the cameras and sensors that are increasingly common in today's cars. Cars equipped with these wireless chips would receive and process signals from nearby DRSC-enabled cars to learn their location, direction and speed -- and detect impending danger. If the driver does not react, the car could then sound a warning or apply the brakes automatically to prevent a crash. Regulators say that cars could also gather signals from smartphones and other devices, which could help them avoid collisions with pedestrians, cyclists and older cars that have been outfitted with aftermarket transmitters. NHTSA said it feels confident in the technology based on its testing, including a yearlong study on the streets of Ann Arbor, Mich., that included nearly 3,000 cars equipped with DSRC. The $25 million study, which began in August 2012, indicated that products from different vehicle manufacturers and suppliers can talk to one another, and "that they work in real-world environments," the DOT said today. The agency said it will publish a report on the tests for public comment "in the coming weeks." The decision to move forward with DSRC technology marks another step in the U.S. government's shifting strategy for making roads safer. Regulators have spent the past four decades emphasizing stronger crash structures, seatbelts and airbags that help passengers survive crashes. NHTSA has finalized dozens of performance rules over the past four decades and continually revised its five-star crash test program to steer buyers to cars that will keep them safe in a crash. But the safer cars become, the harder it gets to continue improving accident survival rates that way. "While the auto industry has made great strides to reduce fatalities and injuries after a crash," said Scott Belcher, president of the Intelligent Transportation Society of America, "the next giant leap is to enable real-time communication between vehicles and with the world around them so crashes can be avoided in the first place." For the new technology to be useful, cars will have to speak a shared language, so that a Honda can communicate with a Hyundai or an Infiniti. But the automakers are putting their own stamp on DSRC technology by customizing the alarms that they use to warn drivers of a dangerous situation. Most automakers rely on beeping sounds and warning symbols in the instrument cluster. Some automakers, like Mercedes-Benz, also use flashing lights. General Motors holds a patent on a vibrating seat that can quietly notify drivers of danger, while Ford Motor Co. uses a rumbling steering wheel. Regulators and automakers are also thinking of other ways that DSRC could be used for purposes besides safety, says Richard Bishop, who led the DOT's vehicle automation program in the 1990s. For example, the new wireless frequency could be used to collect tolls, or to tax drivers based on the number of miles they travel, in lieu of taxes on gasoline and diesel. For all its potential safety benefits, the technology will open up some privacy and security risks, just as the spread of cellphones exposed people to risks that did not exist with land lines. Despite the best efforts of government and industry engineers, DSRC creates a new opening for hackers and holds a risk of privacy breaches. Lawmakers are worried. During a May hearing, U.S. Senate Commerce Committee Chairman Jay Rockefeller, D-W.Va., asked whether wireless communications could potentially allow "some 14-year-old in Indonesia" to "shut your car down." Bishop, who now works as a consultant on automated and connected cars, says the risk isn't as great as the risk from cell phones, because people carry their phones everywhere they go and because phones store more sensitive personal information. But he said that automakers and government engineers should take the risk seriously. "Nothing is airtight," Bishop says, "but that's just the world we live in."